When you get tired of working in New York City and not happy what do you do? You move to Southold on Long Island and open the North Fork Table & Inn. That is exactly what Gerry Hayden, from Aureole and Claudia Fleming, of Gramercy Tavern did and there has been no looking back! The North Fork Table & Inn focuses on Long Island’s local harvest and offers a progressive American menu which varies seasonally. The restaurant’s menu includes organic produce, the freshest seafood from Peconic Bay and award winning North Fork artesian cheese. Of course, let’s not forget the wine list which highlights local as well as national and international varieties. What are people saying about their dinners? This year the North Fork Table & Inn in Southold, NY will be offer a prix fix menu for $68.00 and will consist of a first course, main entrée, and dessert. 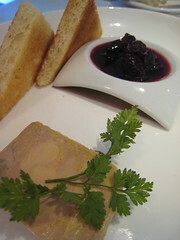 Additionally, they will continue to offer the Chef’s tasting menu. 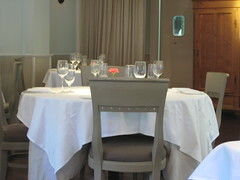 During lunch service, they will be offering both an Ala Carte and Chef’s tasting menu. Call for reservations at 631-765-0177 or reserve on-line. Noah Schwartz, former chef at the Seafood Barge in Southold, has opened a new Greenport restaurant, Long Island. The restaurant is at the former location of the Frisky Oyster Bar on 136 Front Street and is called Noah’s. As the Seafood Barge could not renew their lease, Noah quickly scouted the area and found that this location would be perfect for him. Renovations were underway and now Noah’s is officially open. Noah is a native Long Islander and a graduate of New England Culinary School and worked for over seven years in California’s wine country and then made his move to long Island North Fork Wine country. He has experience in opening restaurants and this one is very special to him, as it is his own. Noah will be bring to Noah’s, a culinary experience enjoyed in California and he is already receiving positive feedback from his customers. Recent reviews had customers raving about the scallop ceviche and pomegranate ribs. The sardines were quite a surprise and totally delicious as is the Pulled Duck from the Crescent Farms in Aquebogue. There are so many Oyster dishes so that you’d think that he’d call the place Noah’s Oysters. Even though the menu is mostly fresh seafood, Noah is a master with the Steak which is done with Manchego Cheese and rich crispy onions, yummy. The concept at Noah’s is to offer “small plates” at the top of his menu ranging from $6 to $15. Thus, allowing his guests to sample multiple smaller plates and enjoying a variety of dishes. The menu also features 2-3 oz. wine pours to accompany the small plates. Of course, to balance this he will also have snacks on the menu beginning at $3. Truly a delightful way to dine! We have eaten there several times and recommended Noah’s to guests who rave about the selections and love the ambiance and personal service. What we love the best are the small plates giving you more choices to sample several dishes. Noah’s Restaurant is now the newest restaurant in Greenport. Call for reservations at 631-477-6720 tell them Arbor View House sent you. Noah Schwartz is a native Long Islander and a graduate of New England Culinary School. He worked for over seven years in California’s wine country and then made his move to long Island North Fork Wine Country. He spent several years at the Sea Food Barge and when that closed he took the opportunity to open his own restaurant. He has experience in opening restaurants and this one is very special to him, as it is his own. Noah’s in Greenport. Noah will bring to Noah’s, a culinary experience enjoyed in California and he is already receiving positive feedback from his customers. Recent reviews had customers raving about the scallop ceviche and pomegranate ribs. The sardines were quite a surprise and totally delicious as is the Pulled Duck from the Crescent Farms in Aquebogue. There are so many Oyster dishes so that you’d think that he’d call the place Noah’s Oysters. Even though the menu is mostly fresh seafood, Noah is a master with Steak which is done with Manchego Cheese and rich crispy onions, yummy. We have eaten there several times and recommended Noah’s to guests who rave about the selections and love the ambiance and personal service. What we love the best are the small plates giving us more choices and the opportunity to sample several dishes. Noah’s Restaurant is now the newest and hottest restaurant in Greenport. Call for reservations at 631-477-6720 tell them Wilfred from Arbor View House Bed & Breakfast sent you. Coming soon- Noah’s new expansion.